Happy Monday babes! So thanks to Hurricane Irma and Labor Day some of my posts are a little delayed, this being one of them. Obviously I wasn't in Cincinnati again over the weekend (I wish!) but I did want to share another brewery from Cincinnati's Over-the-Rhine Brewery District, this time being Christian Moerlein Brewing Company. Moerlein Lager House is one of my favorite restaurant spots in Cincinnati so while I have had Moerlein beer before, this year was my first time to the brewery. It's been awhile but if you remember my first Cincinnati brewery post, you'll remember I talked about Rhinegeist, which is now located in the old Christian Moerlein Brewing Company location. 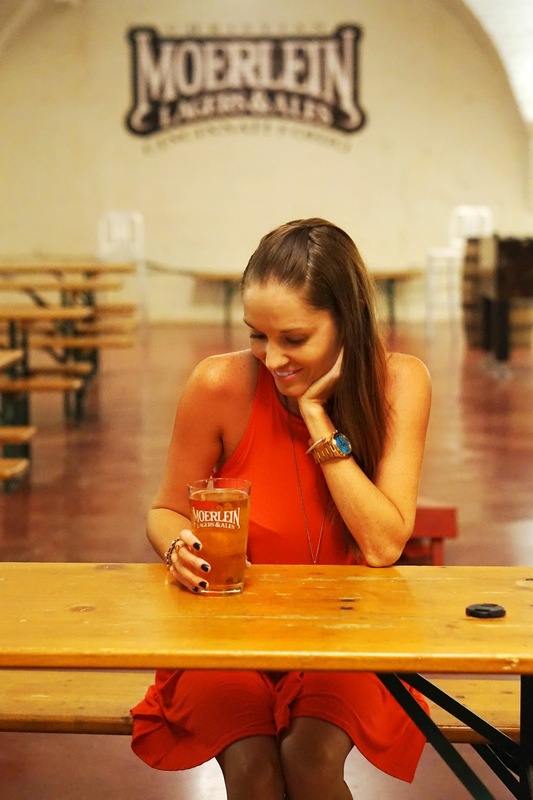 Started in 1853 and the first to certifiable pass the strict Reinheitsgebot Bavarian Purity Law of 1516, Moerlein brews some of my favorite beers in Cincy. The current brewery is located in the old Husman Potato Chip Factory which honestly, doesn't look like much, especially not compared to the Rhingeist location, but I mean... beer, right? If you're ever in Cincy and want to check out Moerlein, I'd suggest to skip the brewery and go to Moerlein Lager House which has AMAZING views of the Ohio River, my favorite bridge, The John Roebling Suspension Bridge, and it's located where the old Reds Stadium was so when you walk in, you can still see the spot of the former home plate. Oh and if you're there, get the Seven Hefeweizen. You can thank me later. Loved seeing your pictures on Instagram from Cincinnati! The beer selection at that brewery looks AMAZING! Happy Monday!! what a fun spot, i mean bc i see dart boards and you know how i feel about that :) love the history there! Looks like such a cool/fun place! Loving your outfit here, too. How fun!! All the beers look good. My husband and I have been visiting a lot of the breweries in our area and it's so fun to see the selection. I don't really drink beer but I can tolerate the sour beers! Such a cute red dress and love it paired with the sneakers! Happy Monday! Ok, how do you find all of these cool breweries when you are traveling? I never know how to do that! I love that you're always visiting local breweries! Definitely looks like a fun spot with great drinks! Sneakers and dresses are by far my favorite combination! I love that red dress, so casual and cool. I need to do this area next time I visit my family in Cincy, so fun! I love finding new breweries! and that color looks SO good on you! You always find the best breweriers! What a fun day! I love your bright red dress, so cute! So basically I need to plan a beer drinking trip to Cincinnati once these babies are born! All of the breweries you visited and described sound so amazing! This sounds so fun! Also lovee that red dress!